More than 100 prospective European students have withdrawn applications to study at a Welsh university following the European referendum result. Prof John Grattan, acting vice-chancellor of Aberystwyth University, said about half of those pulled out the day after the Brexit vote. 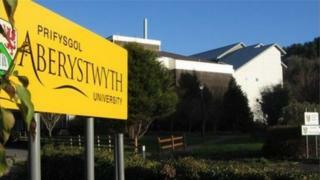 Other Welsh institutions said uncertainty could affect student numbers and finances. The Welsh Government said students are still welcome in Wales. "I won't hide it from you that Brexit poses a challenge to the university," Prof Grattan told students during one of the graduation ceremonies this week. "Over 100 European students have withdrawn their applications to us at this point, 50 by the end of Friday on Brexit day. "That's a stunning impact on our finances. There are 120,000 European students at British universities." Other Welsh universities have also told BBC Cymru Fyw that uncertainty following the decision to leave the European Union could affect student numbers and finances. For many universities, EU and international students are a large part of their income. Aberystwyth had 800 students from EU countries in 2014/15 and 600 international students from outside the EU. A spokesman added: "Unfortunately, news reports abroad have led to articles disseminating the message that EU citizens are no longer welcome in the UK. "Because of this all UK universities have said that prospective students that had accepted firm offers are now withdrawing them, and we are no exception." Meanwhile Bangor, Cardiff, Cardiff Metropolitan and the University of South Wales have all told BBC Cymru Fyw they cannot confirm how many students have withdrawn from courses beginning in September following Brexit. "We are working hard to placate concerns of those students who are beginning courses with us in September and we have been in touch with them in order to assure them that there will be no changes to tuition fees or student loans," said a University of South Wales spokesman. Bangor University added the uncertainty surrounding Brexit could affect "a number of things including student movement and funding" but that "immigration status and relevant fee status" would not change while the UK remained a member of the EU. Swansea and Glyndwr universities said none of their prospective students had withdrawn from any courses yet following the referendum result. Welsh Government Education Secretary Kirsty Williams said Welsh universities would continue to do their best to recruit students from around the world despite concerns surrounding Brexit. "I want to be clear that students and staff from across the European Union are still welcome in Wales."